This five-ingredient fior di latte gelato is a celebration of dairy at its best: fresh, creamy, and pure. Fior di latte, translated literally, means flower of milk. It's a figure of speech, indicating something made with the best quality milk. Often, it refers to mozzarella, but it also refers to gelato in its purest form: no eggs, no fruit, no chocolate, no vanilla. If that sounds boring, it's because farm-fresh dairy from pastured cows is relatively rare in the United States, and Americans have a weak spot for Ben & Jerry's style ice cream, crammed full of mix-ins and ribbons and flavors swirled together. I'm into that, too, but there's something to be said for sweet simplicity, and savoring something pure. Perhaps because I eat dessert for a living, I'm partial to the hidden complexity of fior di latte, a five-ingredient gelato that can only be achieved by sourcing truly extraordinary milk. Or maybe it's because I live in Kentucky, where farm-fresh dairy is easy to come by, although I've noticed a number of larger brands are starting to up their game (at Whole Foods, I've been able to find grass-fed dairy from brands like Horizon, Trickling Springs, and Snowville Creamery, although the selection will differ depending on your location). In a recipe with so few ingredients, quality makes a huge difference, as does technique. But with fresh, flavorful dairy and careful attention to detail during the cooking process, it's possible to make truly phenomenal fior di latte at home. It's a wonderfully fast and simple recipe that cooks in under 10 minutes (and the base can be rapidly chilled in an ice bath to churn and serve ASAP). The first step is to combine sugar, cornstarch, and salt in a 3-quart stainless steel saucier, taking plenty of time to whisk out the lumps of starch. Next, whisk in exactly 14 ounces of milk. It may seem like the gelato could be made faster by heating less milk, but in a sugar-based solution, the cornstarch won’t fully dissolve in a smaller volume of milk—the result would be a thinner bodied base with a very starchy taste and texture, and an icier finished product. Also, since the cooking process will very lightly “toast” the lactose, coaxing out some faint toffee notes (more on that in a bit), adding less dairy at this stage will result in weaker flavor. In a 3-quart stainless steel saucier over medium heat, the mixture should come to a simmer in about six minutes*. Once it starts to bubble, the mixture must be held at a boil for exactly one minute, so grab a timer. From there, you'll immediately transfer it to a large bowl, and whisk in the remaining milk and cream. *The timing of any stovetop recipe will vary depending on the output of a given burner, but it will also depend on the specifics of the cooking vessel itself. I always mention what I use, not to enforce conformity, but to provide context. It's important to realize that cooking will take longer in smaller vessels (less surface area for both heating and evaporation) or those made from less conductive materials (such as an enameled Dutch oven), necessitating more heat. Conversely, the process will move much faster in a larger vessel (more surface area), or one that's more conductive (such as aluminum). In either case, the heat can be adjusted up or down to help keep pace with the recipe's timetable. The base will look a little lumpy at first, so you should continue whisking until smooth. If it remains lumpy, it's a strong indication you may not have the right whisk for the job, an aesthetic problem that can be blitzed away with an immersion blender. Aside from helping the base to cool down faster, reserving a portion of uncooked milk and cream provides the gelato with an infusion of fresh dairy flavor. Cooking 100% of the dairy edges its flavor into canned milk territory. Don't get me wrong, condensed milk is delicious (so much so that I love making condensed milk from scratch), but it's the wrong flavor profile for fior di latte. I love incorporating some of those toasty notes into the gelato, but the freshness is just as important, and a 50/50 split strikes the right balance while ensuring the cornstarch is fully cooked. If you're in a hurry, the gelato base can be cooled to 40°F (4°C) in an ice bath. Otherwise, just pop it in the fridge until it's no warmer than 40°F (4°C) . 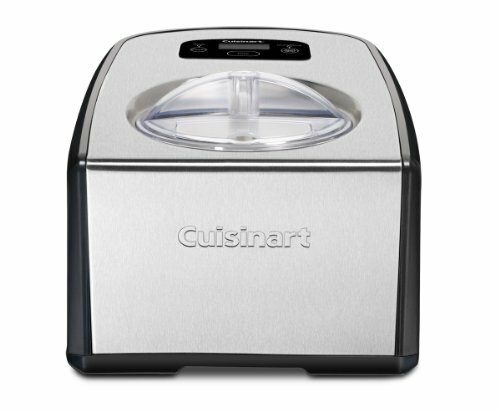 If you're using a canister-style ice cream machine like the CuisinArt Ice-21 (my personal fave), it's vital to confirm the freezer itself is set to 0°F (-18°C). Of course, that isn't a concern for self-cooling machines (for more info, read about our top-rated ice cream machines). In either case, do be sure to churn the chilled gelato base until it's pale and thick. If you're using non-homogenized, or creamline, dairy, the gelato may have a slightly grainy appearance, due to the larger globules of fat. While the texture isn't as smooth as a gelato made with homogenized diary, these larger fat particles translate into more richness and a longer-lingering flavor. Some folks are wild about that mouthfeel; some aren't. The only way to find out which camp you fall into is to try the gelato with both styles of dairy (I'm a sucker for the silkiness of homogenized dairy in ice cream and gelato, but that's a purely subjective stance). Aside from differences in homogenization, the color and flavor of grass-fed dairy will vary by season and brand, depending on what's growing in a given pasture. Those differences will come through loud and clear in gelato, so don't expect to churn up the exact shades you see here. Poor aeration can also make a darker gelato, but that can also be identified by a yield of anything less than four cups, and an objectionably hard consistency. Speaking of texture, gelato is traditionally served at about 16°F, while most American freezers are set around 0°F. My recipe makes a gelato that's soft enough to scoop straight from the freezer like ice cream. If you'd prefer a more authentic experience, however, serve the gelato immediately after churning. Or, after freezing, let it soften to 16°F in the refrigerator before serving; in either case, the gelato will be easier to dish up with a spatula or paddle, as they do in traditional gelato shops. So resist the temptation to doctor it with extracts, and sit back and enjoy the creamy complexity of high-quality dairy at its best.